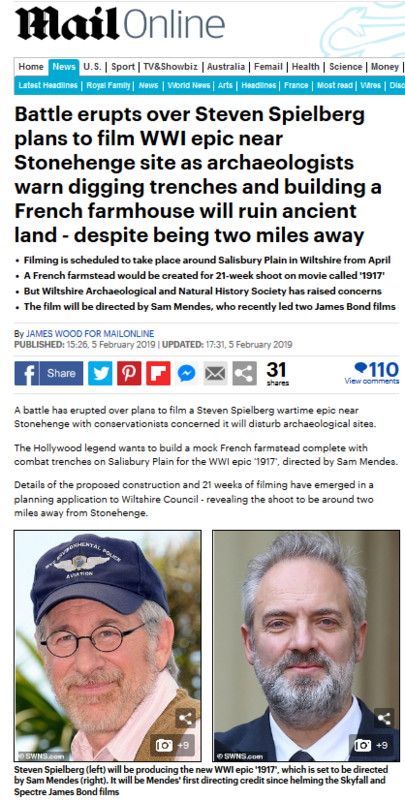 The Daily Mail has today published an article headlined "Battle erupts over Steven Spielberg plans to film WWI epic near Stonehenge" . See the article on the Daily Mail website. The article implies that we oppose the plans as the site is close to Stonehenge when the site is two miles away from the monument. The article refers to the planning application that has been submitted to Wiltshire Council to build the set. The application mentions the use of diggers and the site is close to a Bronze Age burial mound. Our Buildings and Monuments Committee has recommended that a geophysical survey of the site is undertaken before planning permission is considered. Our response to the planning application is standard practice and the Wiltshire Council Archaeology Service, the MoD Arcaheologist and the RSPB have given similar responses. Our Buildings and Monuments Committee consider applications affecting listed buildings and scheduled ancient monuments as delegated agents on behalf of the Council for British Archaeology. The CBA is statutory consultee on such planning applications. The site is in fact almost six miles from Stonehenge and is well outside the boundary of the Stonehenge and Avebury World Heritage Site. We welcome the prospect of a major film being made in Wiltshire, but wish to ensure that the archaeology and environment of Wiltshire is protected. We were not contacted by the Daily Mail for comment before the article was published. For more information about the plans and responses, including ours, please see this page on the Wiltshire Council Planning Portal.